Does your community have a sewing group, and are you a guild member? That’s the question I posed earlier this month, via this blog, Facebook, and Pinterest. It warms my heart to find that, in reading your responses, not only are the sewing/quilting communities strong, but they are largely focused on sewing education and community outreach, two of my own most passionate focuses. Enjoy the selected responses below, plus a spotlight on one featured reader. Find more information on the Quilt To Give sewing community project at the end of the post, or at QuiltToGive.com. With national organizations included in the mix, it is no wonder that many of you talented seamstresses and quilters belong to the American Sewing Guild. “YES! The Vermilion “Sit and Stitch Quilt Guild” is alive and well; and yes I’m a member. I am currently secretary but have led the group in the past. The members take turns planning the monthly meetings, which encompass travelogues (to quilt locations) and sewing tips as well as patterns, new tools and the occasional speaker from outside the group. We have a year-long Birthday Block Club (about 18 members), which keeps us busy as well as reduces our stash scraps. Our ‘Show and Tell’ is a highlight of the meetings. We’re relatively small, about 25 members, but that intimacy keeps us motivated and dear friends; AND there are NO Quilt Police allowed! We donate to “Home Of The Brave” and “Quilts of Valor.” Some are involved with a local (New) Mother’s Resource, making quilts as well as baby clothing, for disadvantaged young mothers, and a new project is making lap quilts for the Ohio Veterans Home in Sandusky, OH. Would you be willing to share a short story and images about any recent projects that your guild is particularly proud of? We have participated in the Ohio chapter of Home of the Brave for those families of a fallen soldier of the middle east wars/conflicts. We joined the project by being included in an assembly line sewing session with another guild. We decided to step out on our own by making up “kits” for our members only. We cut and packaged these ourselves out of Thimbleberry-type fabrics in dusty, subdued, and dull colors, and a neutral or natural muslin background. This was based on the one given quilt pattern derived from a civil war pattern. All we have to do is sew. We have received donations for the fabrics, backing, and machine quilting from ‘American Legion Post 118′, Amherst, Ohio. Two of our members can machine quilt these, though the state coordinator has resources for completing the tops into finished quilts. We are notified when a family receives one of our quilts, which is labeled with the fallen soldier, and the names of the sewer and the quilter . How can other guilds start up outreach and community service at a local level? Many of these projects just drop into our laps when our sewing skills are made known, and then we share with our members. Many programs are extensions of church groups; some are affiliated with hospitals, nursing homes, homeless shelters, and even pet shelters, and in our case, the nearby Ohio Veterans Home. The quilt below is a donated lap quilt for a veteran. Some inspirations have been noted on Sewing With Nancy: Nancy’s Corner. Many are mentioned online. Our members are quite savvy as to needed projects and resources. What is your favorite activity at your monthly guild meeting? My personal favorite is the birthday block club. It keeps me challenged, monthly, by finding an appropriate block pattern; and by matching colors from a piece of focus fabric (about 11″x11″) given to us by the birthday girl; and being able to use up some of my stash. In the member’s birthday month, she receives the varied sewn squares, comprised of her focus fabric in the determined size with coordinated fabric additions, and then she completes her quilt, adding her own sashing/borders/backing, etc. The nice part is that all the piecing is finished and it’s a gift from friends. I find it interesting how different members view the focus fabric and add their own take on colors and block patterns. These are displayed, before they are collected by the birthday girl, and proves to be an education, with discussion, in itself. How long has your guild been active/established? I was not in the founding group, but from what I’ve been told it’s been in existence for at least 23 years. We have a nominal $15 yearly dues, which covers our monthly programs and a donation to the church, where we meet, for the use of electricity and heat. We have an organizational salad and dessert potluck meeting in August to plan for the next 12 months. Members sign up to present a monthly program, not necessarily about quilting; and the birthday block, if interested. We also hold about five Saturday sewing sessions at the church, which allow us to work on any sewing project, ‘ufo’ or ‘phd’. We also have the best potluck lunch in town! The day (10 to 3) is equally social and fulfilling. Do you have any advice or tips for other guilds? Keep the group small (under 30) but if that is unavoidable, my advice would be to provide smaller group projects or mini-groups like our birthday block club. I’ve heard of “round-robin” groups; and block-of-the-month groups. I would think it would depend on the culture of the group and what the majority likes. When members are involved, especially with planning the programs, there is a pride of ownership and no one person becomes burned out with responsibility. July Question: How do you mark your fabrics when sewing? Submit your answer by July 15, 2017, using the form below, to be considered for our July Reader Spotlight. Disclaimer: We may contact you to verify your answer. Your contact information will not be used for any other reason. Your submission to Nancy Zieman Productions, LLC, including contact information, gives us the right to modify, use, distribute, reproduce, publish, and display the submission indefinitely in all media, means, and forms without any payment to you. You hereby represent that you haven’t copied the content from a book, magazine, newspaper, or other commercial source. As you know, the sewing community is a passion of mine. 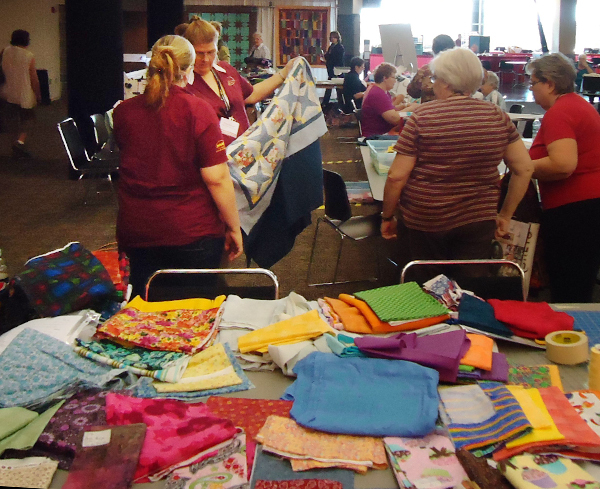 Every year, at Quilt Expo, we organize an area for charitable sewing. Quilters from across the country pitch in to create bed-size Quilts To Give. One quilt may have as many as twenty different people working on it. Visit the Quilt To Give web page to learn how you can host a Quilt To Give event with your guild or sewing community. Do you buy hand seen quilts? Thank you for following the Nancy Zieman Productions Blog. We’re sorry, we do not purchase finished quilts and/or projects. I belong to two charity quilting groups. One meets the first and fourth Thursday’s ( 10 to 4) year round, the other meets every Tuesday ( 9 to noon) sept thru april. The quilts end up in Africa, South America and Mexico. I mark mostly with green frisson pens! I enjoyed reading the June Reader’s Spotlight, Diane Langham. In the picture at the end of the article, with all of the ladies in aprons, the fourth from the right, is wearing a vintage apron like one I have. I always wondered if it was handmade or store bought. My first thought seeing this picture is that it must have been store bought – followed immediately by thoughts of how many duplicates my friends and I have sewn…. For past 3 years have led our quilting community in the mission of Quilts of Valor here in NW Indiana inspiring others to volunteer their time making these patriotic quilts to award to our veterans. Each one is special and filled with love and thanks to each veteran. We can always use fabric to make more! Come join us. I usually use markers that disappear with an iron. They are great for clothing, embroidery and quilting! For marking I usually end up with the ole standby – soap slivers and chalk. But pens work better on the curves! I am sure there are quilting groups locally,, but I have not joined any. However, my daughters and I get together about once a month for Craft Day, where we work on our current projects (whatever they might be) and gossip, exchange news, and generally, use crafting as a way to stay in touch. I have noted that life seems to keep everyone so busy anymore that people seem to need an established reason to plan family time around everyone’s varied schedules. This is how we find our family time. We even have a closed membership “Family Craft Day” Facebook page to plan our next “meeting”, exchange ideas and pass on family information. I think one reason I haven’t joined a local sewing/quilting group is because I don’t think I’d get much done, other than gabbing! I use a water soluble marker & chalk. One of my favorite marking tools is soap. The thin slivers of a piece of soap are perfect to slide along a ruler or mark an “x” point on fabric. And the mark usually remains long enough for me to sew the seam or join pieces where the mark indicates. Then it rubs off easily without leaving any residual mark to worry about removing. I belong to 2 quilt guilds. And love sewing for a local charity listed above. Both inspire me to enjoy sewing and quilting projects. I usually use heat erase marking pens for most projects. I use water soluble markers and tailor chalk. I use chalk more on embroidery and the markers on other sewing projects. I do have some frixion pens and use those too. Works for me. Thanks!! I tend to mark very differently today than I used to back when I used carbon paper and wheel. Now it is mostly air erase and since take up quilting I adore the heat erase pens.